Th-INK-ing of You: Blessings in disguise & a Sneak Peek! Recently, a young woman was talking with her dear friend. This friend had been going through some difficult times and was feeling down and alone. She expressed the feeling that she didn't think anyone in their town cared about her or her family at all. Later that week, a tornado ripped through their town, the first in this mountain town in over 50 years! It leveled buildings, trees and left a number dead or injured. One of the areas hit particularly hard was where this friend lived. They lost over 75 trees, both of their vehicles, a garage, and some damage was done to their home, but thankfully they were protected. The next day, people started showing up with chain saws, heavy equipment, water, food, supplies.... there were over 30 people working on this family's lot alone! They continued doing so for weeks!!! She finally realized just how much people cared for her and her family! The next Sunday in church, the special music, which had been planned and practiced long before the tornado struck, was this song - Blessings, by Laura Story. I have shut my playlist off for today so you can listen to this. If you can't hear it, the words are on the Stampin Sisters in Christ Challenge blog. A few weeks after the tornado, my husband and I sat in the church where these two young women attend on a Sunday evening, where people of the church had gathered to sing praises and give testimony of God's grace and mercy! It was all I could do to not be weeping as one after another told their story.... yet each one, in spite of having lost much of this world's "things" had such joy and thanksgiving for all God had done for them! It seems that some of their blessings truly did come through the rain and wind and storm! Also recently, here on the east coast of the U.S., in ONE week, we felt the tremors of a 5.9 earthquake and the powerful forces of a huge hurricane that slowly made it's way up the coast, leaving a path of floods and destruction.The people of Texas have been enduring the worst fires imaginable. The news every night is full of sensational stories of pain and suffering all over the world! Wars, famine, hatred, murders, earthquakes and disease abound! It's all around us and I am sure that in our own lives, not one of us is without burdens! Perhaps we have sat at the bedside of a suffering loved one, watched a parent slowly disappear into a world we cannot seem to reach, prayed through sleepless nights over broken relationships, buried that loved one we thought we could never live without, lost that baby we thought God wanted us to raise, and cried for help in the midst of our darkest hour. We've had our moments when our faith has been tried, and we've even had times when we had some doubts. We've asked Him "WHY? Why are you letting me go through this?" I shared this song today because I know so many are suffering through some dark hours right now! The words touched my heart and I hope they will yours as well. As Christians, we tend to think our lives should be trouble free and just the way we "want" them to be. When they're not, we pray that God removes the painful things. I know for myself, that some of my darkest hours have ended up being my greatest blessings: times of growth and a refocusing on what's really important; times of realizing how gracious and merciful God has been to me! I don't think I would ever fully have appreciated the gift of this life had I not almost lost mine at the hand of a hit and run driver. I'm pretty sure I would not have learned to truly forgive unconditionally if I had not had that experience. I also don't think I would have had the compassion for people who are suffering had I not been left with chronic pain myself. My pain has given me many opportunities to encourage others in a way I never would have otherwise! Sometimes some of us need to stay broken for a while so that God can do the work in us that needs to be done. Perhaps instead of praying for removal of the pain, we should be praying for His will and glory to be seen in it all, for growth in our relationship with Him, and for the joy that comes from really being surrendered to and loving our Savior and knowing that His plan for us is always the best plan! Remember this.... He loves us enough to give us what we need, not necessarily what we "want"! When we are in the deep waters, we may not see the blessings He has for us... but He has a plan for each of us, and it's for our good! Ps. 30:5b "...Weeping may last for a night, but joy comes in the morning." John 16:33 "These things I have spoken to you, that in me you may have peace. In the world you will have tribulation, but be of good cheer, I have overcome the world." Rom. 8:35, 37-39 "Who shall separate us from the love of Christ? Shall tribulation, or distress, or persecution, or famine, or nakedness, or peril, or sword? I hope He pours out His Blessings on you today! My challenge is to create a card that either uses the word "Blessings"
or uses an encouraging Scripture. 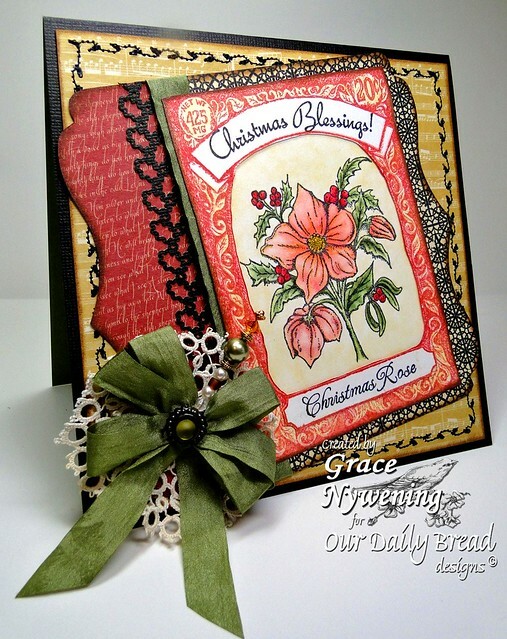 Stamps: This is a sneak peek at a new Our Daily Bread designs stamp set called Christmas Rose. I placed it in the Seed Packet from this month's release. I told you that you'd want this seed packet! :) Stay tuned for more great stuff to use it with! Papers: The base is Coredinations, designer paper is Websters Pages. I used Memento and Versafine Inks. Accessories: Copics, MS Holly Punch, May Arts Wrinkled Ribbon, Tatted Lace from a vintage piece, stick pin with elements from my sweet dt sister, Sabrina, sewing machine, Tattered Angels Glimmer Mist Irredescent Gold. Be sure to stop by the Stampin Sisters in Christ site to see all the details on this week's challenge! Our sponsor this week is Pink Cat Studio! They are giving aways 5 free digis! We thank them for their generosity! WOW Grace - this was an awesome devotion, beautiful song too. It is all so true, Blessings surround me right now - even though or especially since life is difficult. Thanks so much for the great devotion. OH - fantastic card! I love this sneak peak!!! Have a great week! Wow I love this flower but not sure it looks like a rose? I can't wait to get some xmas stamps, I guess I'll have to wait until next week. Gorgeous card. What a true and beautiful post Grace!! So many inspirational words to focus on. I pray it blesses many!! I really enjoyed listening to my "Motto" song as of late. It really makes you think. Your card is over the top gorgeous my friend. I love everything about it from the ribbon detail, colors, layout, and gorgeous coloring. Stunning!! Say an early happy Birthday to your dear hubby for me. I pray he has a safe trip tomorrow. Enjoy your day with your dd and grandkids. TTYS! You've designed and executed such an elegant card! Thanks for lounging with us at Our Craft Lounge! Grace, I cannot begin to express how I feel today - your post has challenged me deeply and yet not without encouragement as it gives me hope that one day I too will rise above the storm. Thank you. What a happy ending to the story. Just beautiful and so is the song. Your card is gorgeous too! Grace, your card while beautiful is second to the wonderful devo you shared. I so look forward to coming down Sunday's to see what will be on the Stampin Sister in Christ Blog and you blew me away today. Blessings is such a beautiful song and the video with it, WOW. Then to hear the story of those young women, well, thank you! When things get tough I always try to remember 'what does this really matter in the light of eternity', but that isn't easy with life tugging at us. Blessed by what you shared today. Hugs. Grace, thank you for sharing from your heart today. It was definitely a God thing about this song. Praying that you have a "Blessed" day today!!! Thanks for sharing such an inspirational story Grace. The dark times can be so overwhelming. It's nice to be reminded to look for the blessings. Your card is STUNNING too! I love the tilted panel and your fabulous stitching and coloring. And the colors are just so warm. Thank you for a wonderful inspiring message. It spoke so deeply to my heart. Sometimes we can be so overwhelmed so it is good to be reminded of God's love for us and that all we go through is what we need not necessarily what we want. Yes! we do see His belssing in everything we endure. Blessed be the God and Father of our Lord Jesus christ, the Father of mercies and God of all comfort, who comforts us in all our tribulations, that we may be able to comfort those who are in any trouble, with the comfort with which we ourselves are comforted by God. Recently diagnosed with metastatic desease (secondary cancer in the lung) I was able to comfort another lady with much worse lung cancer. I made her a card and was able to show her how much I cared. I am not very good with words but was able to comfort her with the comfort that God had for me. She doesn't know the Lord so this is terrifying for her. I pray that through this I am able to pray for her and she will know the Lord like I do. I pray for all the people over there in America that have gone through so much. Your card is a joy to behold. your craft is beautiful grace. I also enjoyed hearing the song from Laura Story. Hi Grace; your card is really lovely; I specially admire the bow with three laces an d the beautiful sawing around! Thanks for showing your card and participating with us at Crafty Ribbons this time! Beautiful, Grace! Love the music, too! Beautiful artwork Grace! Your heart is beautiful as well! Another stunner!Love the design and the colours. Thanks for playing at The Crafty Pad this week in our Stitching Challenge! Stunning Grace! Wonderful combination of ODBD images, fab design, coloring and added embellies! BEAUTIFUL CARD !! I like it very much. Thanks for joining us at ATS. Christa. Stunning card. Thanks for playing along with The Squirrel and The Fox, hope we'll see you again soon! What a stunningly beautiful card. I love that gorgeous big bow, beautiful! Thanks for sharing with us in our Anything Goes challenge at Crafty Ribbons this time. Hope to see you again next time. Wow Grace!! !Awesome devotion! !I love the Laura Story song Blessings. Just to let you know that you said that you turned your playlist off for today that playlist.com does have this song and others by Laura Story. Just a thought. Your card is beautiful!!! I love the red with the green bow. It looks awesome and I think this ODBD image is one of my favs!!! !Beautiful job!! Grace, I said it on the other blog but have to say it again, how powerful your testimony and what a great devotional. The card, it just goes without saying is gorgeous (oops I said it anyway!). You have a gift with yoru words combined with your heart, using them for the Lord. Thanks for the blessing of sharing it. This is AMAZING! Gorgeous card! Hi Grace, I don't think I visited your blog for this particular devotional until now! I saw it on the SSIC blog, and then later revisited the song you shared...which was a huge blessing to me this week. I played that song many times and it helped to relieve some of the grief in my heart. I appreciate your devotions so much, and this one was particularly meaningful...I agree that we need to seek the relationship in the midst of our trials, and see the beauty (though sometimes it is soo hard to see it) that God has our best in mind. A book I am read this past week while traveling was "Safely Home" by Randy Alcorn...a very powerful look at suffering of the saints in China. I just thought I would share it on here as your devotional has some of the same thoughts. Your card is gorgeous, can't wait for the ODBD release and blog hop!! I have had many unhappy events in my life and am just coming out of the darkness of a depression. I too think you have to experience this kind of pain to become more tolerant and compassionate towards other people. Many thanks for joining in with our Use Your Favourites challenge over at OSAAT. Hope to see you back again soon. Ooohhhhh what a beautifull card!!!! Love how you colored the image!!! Such an inspirational story, and a stunning card to go with it. Thanks so much for sharing it with us at THE CRAFTY PAD this week. Your card is beautiful! I love the lace and the stitching. Your coloring is always incredible...today is no different. I really love the bow on the corner...amazing! But what is really inspiring and such a big part of you is your heart, Grace. Your words brought me to tears, the song brought me to tears, the love of the Lord-brought me to tears. Tears of sadness--of times when I don't look for the blessings through the storm...especially with chronic pain and the storm hits every day, all day...the time I am wasting...staying in the storm. Tears for gratitude, that I know in my heart that the Lord has the best plan for each of us...even if it seems like the furthest thing from the truth. Your friendship, where you remind me of such important things, so often...I am forever grateful...whether the words are shared here on your blog, or not...the wisdom He has blessed you with, and the skills to say things in a way where everyone can hear what they need to...is such a Gift of God. You are blessing to all of us, I am sure. I know you are to me. This Devotion in its entirety has moved me more than anything-anywhere in a long time. Thank you. Gorgeous! I love he colors, coloring, layers & STITCHING!